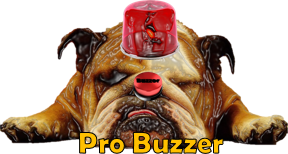 ProBuzzer: The most dangerous job in the world? 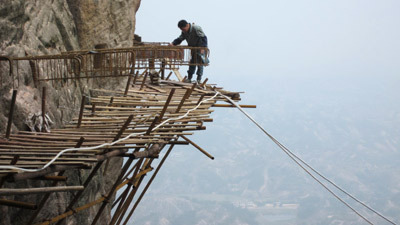 Workers building a wooden path on the side of a sheer mountain in China are putting a brave face on one of the most dangerous jobs in the world. Each day, they work on the precarious project thousands of metres above the ground knowing one slip would be their last. The wooden path, on Shifou Mountain in Hunan Province, will be nearly two miles long when finished, the longest of its kind in China. The narrow walkway is held up by wooden supports which sit in holes which the workers must first drill into the cliff face. The mountain path builders mostly grew up in the mountains of Jiangxi Province and say the work comes naturally to them. Yu Ji, 48, said he had been working on high cliffs building such roads for more than 10 years. "Young people don't want this job, as it means we have to stay deep in the mountains for months, sometimes even years," he said. "But I don't feel it's so different from any other job. It's not as dangerous as people think. You just wear the ropes, and then everything is okay."